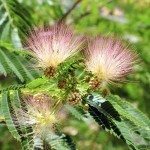 Would a mimosa tree be suitable for New Zealand climate? Can you advise, as I would like to have highly perfumed trees or shrubs. My son and family have just got their own home there and I want to send them something for their new garden. Yes, this tree should do fine there. It requires well-drained soil and full sun. Tolerates wind and drought. When dormant are hardy to about -20°C. but only hardy to about -10°C in the maritime climate of this country. The young growth in spring, even on mature plants, is frost-tender and so it is best to grow the plants in a sheltered location. If killed back to the ground by a severe winter, plants can often resprout from the base. Plants are quite tolerant of pruning and is best done in late winter or early spring.